LED technology has evolved rapidly in the past few years and the market has expanded greatly. LED drivers are a critical component of the LED lighting system. Its design affects operation, presence of flicker, service life, controllability and ability to withstand power surges. The overall trend is toward greater functionality. LEDs are designed to run on low voltage (12-24V), direct current electricity. However, most energy sources supply higher voltage (120-277V), alternating current electricity. An LED driver rectifies the higher voltage, alternating current to low voltage, direct current. LED drivers also protect LEDs from voltage or current fluctuations. A change in voltage can cause a change in the current being supplied to the LEDs. LED light output is proportional to its current supply, and LEDs are rated to operate within a certain current range (measured in amps). Therefore, too much or too little current can cause light output to vary or degrade faster due to higher temperatures within the LED. In summary, LED drivers convert higher voltage, alternating current to low voltage, direct current. They also keep the voltage and current flowing through an LED circuit at its rated level. LED Drivers are divided into 3 categories: Constant Current, Constant Voltage, and Programmable. Each type of driver is designed to operate LEDs with a different set of electrical requirements. Constant Current LED drivers have a designated range of output voltage and a fixed output current. The constant-current drivers power LEDs will have only one output current specified, labeled in amps or milliamps, along with a range of voltages that will vary depending on the load (wattage) of the LED. The Constant Voltage LED drivers are designated for a single direct current output voltage. Constant-voltage drivers power LEDs require a fixed output voltage with a maximum output current. In these LEDs, the current is already regulated, either by simple resistors or an internal constant-current driver, within the LED module. These LEDs require one stable voltage, usually 12V DC or 24V DC. Lastly, Programmable LED drivers allow for the personalization of the user’s desired output current. Functions can range from small electronics to much larger applications in the commercial and industrial field. When replacing a driver, the old driver’s input/output requirements must be matched as closely as possible. According to the NEC (National Electrical Code), LED drivers should be paired with LEDs that use 20% less than their maximum rated wattage. Drivers should not be paired with an LED that is at or exceeds the driver’s maximum wattage to avoid overstressing the driver components. For example, if a driver operates at a maximum of 96 watts the LEDs used cannot be more than 77 watts. Both constant-current and constant-voltage LEDs and drivers can be made with a dimming capability. Power factor describes how efficiently an LED driver uses electricity. It is calculated by dividing the power being used by the driver (wattage) divided by the product of the input voltage times the current going in (volts x amps). The range for power factor is a decimal between 0 and 1. The closer to 1 the power factor is, the more efficient the driver is. A good power factor is 0.9 or above. What are some of the newer uses of LED drivers? LED drivers are now increasingly used for automotive lighting solutions. The LED drivers help to increase visibility and provide energy saving solutions. Inductive LED drivers are used for applications using multiple strings of LEDs such as those used for smartphone backlighting. They operate more efficiently and use lower output voltages resulting in longer battery life. What factors should be considered when choosing the right LED driver? The function of an AC LED driver is to step down the input voltage to a lower output voltage to meet the LED’s small voltage needs, usually 12 or 24 Volts. It is illuminated in function to bulbs that already have an internal AC to DC converter. What forward current does your LED need? How powerful driver an LED driver is needed? 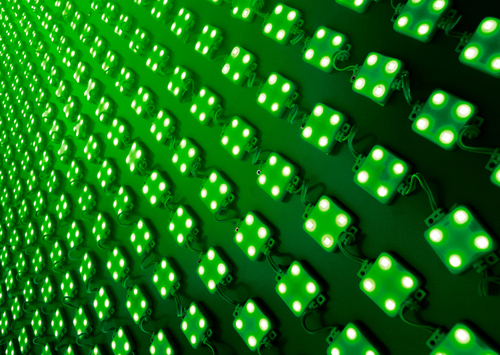 The type of number of LEDs to be used must be specified. To determine the maximum number of LEDs that one can run from one driver, one divides the maximum output voltage of the driver by the forward voltage of the LEDs. What output voltage range is needed from the driver? Is dimming required? And what type of dimming? A need for dimming is mainly dependent of the specification of your luminaire. If you don’t need dimming, a normal on/off driver is enough for you. What are the physical dimensions of the package into which the driver must fit? In what kind of environment is the luminaire to be used in order to determine the degree of protection (IP-classes) required. Luminaires are given an IP-classification. The IP-classification consists of a two-digit code that describes the degree of protection against solid objects as well as moisture and water. IP20 class driver means that this driver may be used in indoor lighting applications but cannot withstand the harsh conditions in outdoor lighting . On the other hand IP67/68 drivers are heavier in weight, the electronics is molded with plastic (e.g. potted) and the electrical throughput of the wires both on primary voltage and the secondary voltage side are sealed with required protection against moisture. When selecting the right LED driver are there any special approvals needed? Are the approvals for Europe (ENEC) or America (UL)? Jasper Electronics has supplied standard and custom designed power supplies like LED drivers since 1995. They offer a very wide array of LED lights which can be used in indoor and outdoor setting including street lighting, tunnel lighting, garden lighting, bay lighting, etc. We invite you to visit our website at pentech.com to browse at our line of products. If you have any specific needs or questions regarding LED drivers or any of the equipment we represent, please contact us at Peninsula Technical Sale either via e-mail: sales@pentech.com or via phone 650-965-3636.